Twister reviews, readings, and other newsy items. April 13 – May 11, 2019: Participating in the F213 National Curatorial Exhibition at Arc Gallery, with a fantastic group of women artists and writers. Opening reception on April 13, 7-10pm. Thanks to Catamaran Literary Reader for nominating my story “Your Hysterical Wife” for a 2018 Pushcart Prize! Here’s a link to read it online. 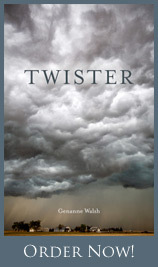 Bookish Beck: “Twister was a novel I read slowly, just 10 or 15 pages at a sitting, to savor Walsh’s prose. … one to linger over as you appreciate the delicacy of the characterization and the electric descriptions of the impending storm.” Four star review. I’m happy to have a story, “Your Hysterical Wife,” in the Catamaran Literary Reader, Winter 2018 issue. Here’s a link to read it online. Twister was selected as a Finalist for the 2016 Sarton Women’s Book Award. Thank you to Story Circle Network for this recognition. Berkeleyside: Best Books of 2016. I’m delighted that Lucy Jane Bledsoe included Twister on her recommended reading list. Twister was selected as a Finalist for the 2016 Housatonic Book Award in Fiction. Glad to have this recognition for the book and for Black Lawrence Press. Here’s Deni Scofield reading an excerpt from Twister at Stories on Stage Davis in June. Such a great night! Twister on the Small Press Distribution bestseller list for January/February. And again for March/April. Thank you! Largehearted Boy: Here’s a playlist of songs referenced in Twister. Emerging Writers Network: I had a great time talking with Lori Ostlund about Twister. Here is the interview. I highly recommend Lori’s fabulous books. The Nervous Breakdown published a self-interview and an excerpt from Twister. Here’s a short excerpt and a fun, quick Q&A covering important topics such as coffee (pro) and comparing ourselves to others (con). March 25, 2019: Odd Mondays reading series with Michael Alenyikov, Andrew Chen, and Wilfredo Pascual. March 9, 2019: Noe Valley Authors Festival at Noe Valley Word Week. January 26, 2019: The Rolling Writers reading series. December 11, 2018: Zuri Pages Reading Series in San Francisco, with Susan Ito, Jenny Bitner, and Nia McAllister. November 13, 2018: Perfectly Queer Reading Series at Dog Eared Books, celebrating Rick May’s birthday. October 1, 2018: Odd Mondays Reading Series, Folio Books, with Kirstin Chen and Rebecca Winterer. September 13, 2018: Why There Are Words in Sausalito, with Scott Shibuya Brown, Nona Caspers, Jacqueline Doyle, Dean Rader, and Sarah Suzor. January 21, 2018: With Rebecca Winterer, Peg Alford Pursell, and Shauna Hannibal at Adobe Books. October 14, 2017: With Rolling Writers at San Francisco’s venerable Lit Crawl. October 15, 2017: Black Lawrence Press authors at the Octopus Literary Salon. July 17, 2017: Guest reader at the book launch party for Richard May and Wayne Goodman. Folio Books. June 2, 2017: Black Lawrence Press authors at the Bay Area Book Festival. The Octopus Literary Salon. February 16, 2017: Story is the Thing: Kepler’s Quarterly Reading Series. October 15, 2016: Lit Crawl (with Why There Are Words) at Haus Coffee. July 27, 2016: InsideStoryTime. Octopus Literary Salon in Oakland. June 11, 2016: A selection from Twister at Stories on Stage Davis. May 23, 2016: At the Inkwell SF series: Novel Night. Alley Cat Books. May 18, 2016: The Unauthorized Eleanor Wilner Reading Series (Friends of Writers fundraiser), Cambridge Boat House, Cambridge, MA. May 15, 2016: The Joan Hutton Landis Summer Reading Series at Big Town Gallery, Rochester, VT.
April 1, 2016: AWP book signing. Black Lawrence Press booth #1526. March 31, 2016: Black Lawrence Press AWP reading and party. CB1 Gallery. March 24, 2016: “How to Get Your Book Published,” panel for Noe Valley Word Week. March 14, 2016: Perfectly Queer series at Books Inc. Castro. March 14, 2016: Guest on “Let Me Touch Your Mind” interview series, KPOO. Feb. 17, 2016: A book party for Twister at The Booksmith. In conversation with Peg Alford Pursell, who runs the fabulous Why There Are Words literary empire. Thanks to all for a stupendous celebration! January 14, 2016: Why There Are Words in Sausalito. April 18, 2015: Rolling Writers reading series.